UPDATE: The Swans of Wells project is almost at an end. 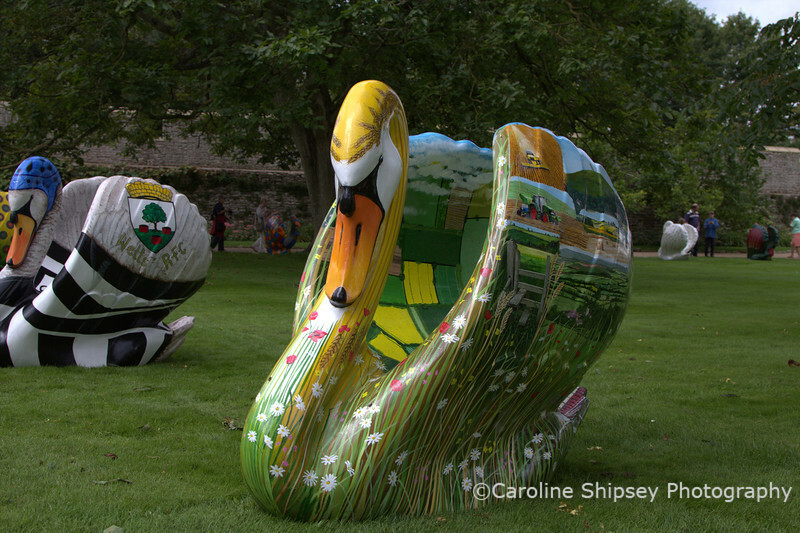 On 15th and 16th September all the Swans were on display in the Bishop's Palace from where they will be auctioned on 29th September, with all profits going to local charities. The streets looked somewhat bare after they had all been removed, it really was a great project providing enjoyment in many forms. Swans of Wells is an arts project that will be on the streets of Wells from June 2nd 2012 for 3 months until the beginning of September, to celebrate the Queen's Diamond Jubilee. At the end of this period they will be auctioned for charity. There will be 60 swans sponsored by businesses, organisations and individuals, and decorated by some amazingly talented artists. Why Swans sculptures? Visitors and locals alike enjoy seeing the resident swans on the moat of the Bishop's Palace and particularly seeing them ring the Gatehouse bell for scraps of food. The swan is also traditionally a royal bird, with the crown of England owning all unmarked swans in open waters. As soon as I saw the first swans in the Market Place I couldn't resist trying to photograph all of them - they are beautiful, fun, clever and a great asset to the city. I really hope they don't get badly damaged during their time on the streets. There is a Trail Map available at £1 in lots of shops etc which shows the locations of the swans. They are numbered and named with details of the sponsors and artist.